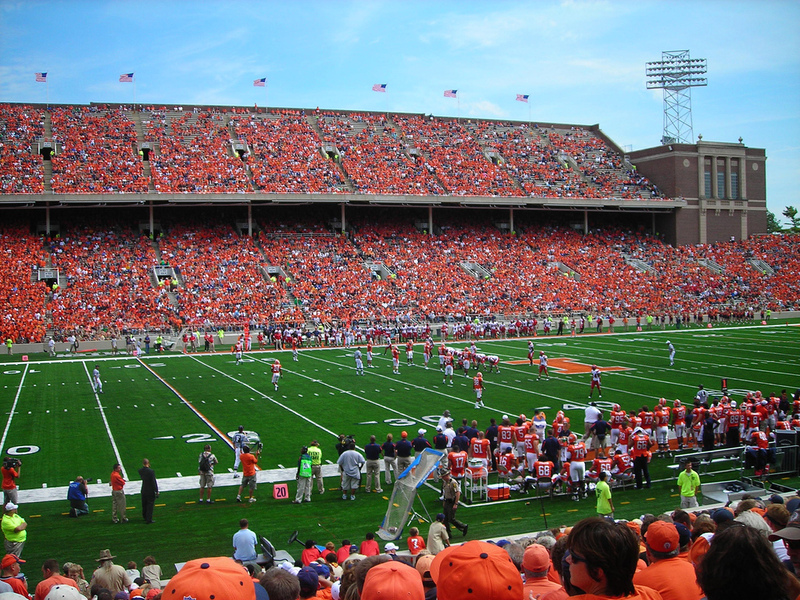 Memorial Stadium is the home of the Illinois Fighting Illini Football Team. The seating capacity of the stadium is 60,600. Memorial Stadium was originally completed in 1923 and the name was chosen to honor the dead from World War I. Memorial Stadium at the University of Illinois was officially dedicated on October 18, 1924, a date on which the University of Illinois football team played the University of Michigan. On that day, Red Grange scored six touchdowns in one of the greatest performances in football history. The football playing surface within the stadium is named Zuppke Field, honoring Robert Zuppke, the University of Illinois head football coach from 1913 to 1941. Heavy rain during the construction of Memorial Stadium resulted in a bulldozer sinking into the field. It was decided that the expense of removing the bulldozer would have been greater than leaving it buried under the field. It remains there to this day.